Teenagers may not think about the sign that shows them where they can take a date to a movie or where they can quench their hunger at a drive-thru. So it can be eye-opening when they see a sign up close and in production. That is the result of Sign Manufacturing Day, held Oct. 3, which drew students from elementary, middle and high schools as well as those enrolled in community and technical colleges. The event is sponsored by the International Sign Association in conjunction with the National Association of Manufacturers. In South Bend, Ind., North American Signs offered to open up its facility for student groups. Overwhelmed by the response, the company worked with its local Chamber of Commerce to find other manufacturing facilities to join in offering tours. The Chamber helped promote the fact that entry-level manufacturing jobs in the region have starting salaries of $33,000-$40,000. In all, more than 500 students participated. 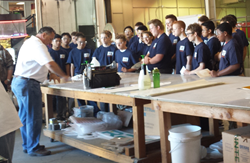 In Washington, Mo., nearly 400 students toured Ziglin Signs, Inc., throughout the day. Lewis Sign Builders in Buda, Texas, drew more than 100. In all, more than 1,000 students toured ISA-member companies. In Dartmouth, N.S., Mattatall Sign employees offered engraved acrylic souvenirs to high school and design college students who provided a digital file of their artwork. Several participating sign companies were asked about internship, co-op and job-shadowing possibilities for students. Sign Manufacturing Day occurs the first Friday of each October. Though the next event is nearly a year away, there is no reason sign companies cannot reach out to high school, community college and technical schools to schedule tours outside of Sign Manufacturing Day. ISA has developed resources which can help companies. Contact Alison Kent (alison.kent(at)signs(dot)org) to learn more.